The destruction of the shadow business empire Gulnara Karimova built does not indicate her father, the president of Uzbekistan, is growing weak; on the contrary, this is a sign of his might. On Monday, three closest allies of Gulnara Karimova were forcibly driven to the office of the Prosecutor General of Uzbekistan. These people are close to both her body and pocket, including her common-law husband, who is registered as the owner of her business assets in Uzbekistan and abroad. Such events are unfolding around the Uzbek president’s elder daughter, whose activities are closely investigated into and scrutinized by local investigation bodies since last fall. While some see the weakening regime’s inability to stop these troubles, I look at the situation from a different angle. I think the event happening in Tashkent is absolutely not an episode in a series of power struggles ahead of a physical departure of the current president from the political scene. To my mind, there is no such thing as “Gulnara’s political clan” or the “Clan of power wielders” that is supposedly confronting her. In reality, there is no more or less observable shake in the Karimov-built “vertical of power,” which he erected over the last twenty years. Everything is still under his control; at least as long as he, “Grandpa,” is alive and kicking, and is still at the helms for the last quarter of a century. And there is no reason to believe he is ailing — just look what a zinger he was at the Sochi Olympics Games opening ceremony! There is not such thing as “special services conspiracy” either, who are allegedly working to eliminate a competitor aiming at her father’s throne without his knowledge. There is “competitor” to begin with. Gulnara is only a daughter of a tsar, who was allowed to whatever her precious soul wanted: to speak whatever she wants to; to throw extravagant balls and receptions; and to pretend to be a political scientist, a politician, a fashion designer, a karate master, and to destroy successful businesses other built, using, by the way, those very power wielding bodies that are “bringing down” her business lately. In a word, she was a princess. However, in a country such as Uzbekistan, she stands no chance and has no right to eye the throne. The “coup de grace” Gulnara is being dealt in no way indicates Karimov’s singlehanded authority is waning. On the contrary, it only proves his strength and sober mind and reason. Karimov still controls everything happening in his khanate under control. And only he could have possibly given an order to destroy the thriving, expanding and influential shadow business empire his daughter Gulnara has built. But why would he do that? There are several factors to consider. To my mind, the most important one among them is his understanding and grasping of the seriousness of damages his daughter’s activities are inflicting on the image of the state of Uzbekistan. Over the last twenty years, we heard many times a foreign investor or a company would pack its bags and leave this Central Asian nation because it no longer could or would tolerate pressure the local authorities exerted. The Uzbek side unexpectedly closed U.S., Indian, Turkish and Russian factories and companies, which were immediately sold to other partners, who were less demanding and more complacent. And yet, foreign investments and financial assistance continued to flow in, including from those very United States, those very Russia and Europe, and Asia. But the last two scandals were certainly what would one call “a cold shower” on foreign partners Uzbekistan had. First, the corruption scandal the Swedish-Finnish TeliaSonera found itself in, and second, the Russian MTS’s wholly owned subsidiary in Uzbekistan, Uzdunrobita, was kicked out of the market and the country. Apparently these two scandals are somehow related to Gulnara. One sees her people’s, not those of the authorities, “fingerprints” in both cases. The bank accounts where kickbacks and bribes apparently landed inevitably lead to Gulnara, not to a minister or the presidential administration. The millions of dollars several European nations froze belong to her; either under her name or her close one’s names. It is her name printed and pronounced in hundreds of publications and shows in Uzbek mass media, ensuring her “the daughter of the Uzbek president” title is never forgotten. And as long Gulnara enjoys influence, these reputational losses are ever increasing and catastrophically damaging the Uzbek economy in parallel. The presidential daughter’s permissiveness and financial uncleanliness, mildly put, are showing Uzbekistan in worst possible image, inflicting very real and serious disgrace, and instilling firm conviction in the foreign investor to shun the damned Uzbek lands. Perhaps, Karimov Senior realizes all this. On the other hand, maybe there are people around the president who were willing to settle long unsettled scores with his daughter. They gently pushed “Grandpa” to make decisive moves against her just when the tide of events started overwhelming her. Showing everyone around that he would not let even his own children “misbehave,” Islam Karimov is displaying himself as a real “patriot” and “statesman” (as he understands it), and not just a despot and autocrat as he was earlier known. He is thus showing that for the sake of the image and interests of his state he is ready to discipline his own daughter, who was enjoying all imaginable legitimate and illegitimate advantages under his patronage. Over the last fifteen years, the head of Uzbek state proved everyone in the world that he just does not care about criticism showering on his country for poor human rights records. He is indifferent to all that buzz about tortures in prisons, forced sterilizations of women in maternity houses and forced child labor on cotton plantations. However, he does become sensitive when foreign investors keep steering clear of Tashkent and the unreliable Uzbek economy despite a big number of decrees he signed to favor them. That very economy which his relatives robbed and whose budget is shrinking to the absolute zero. Putting Gulnara’s machinations on “Break” is to primarily serve as a signal to western partners; I am still the president and you can still strike deals with me, so to speak. On the other end of the spectrum, the signal is meant for “domestic consumption”: let the citizens know that he is a just and strict father. 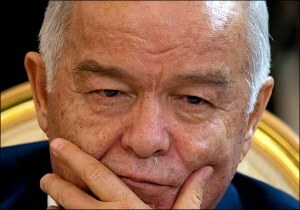 He is the father for Gulnara and the Uzbek nation. And let’s not discount former hopes and pretentions Gulnara used to harbor regarding power and inhering her father’s throne. Also, we must not forget the whole issue of power succession, which the head of Uzbek state cares about more than attracting foreign investors. Apparently, Karimov never thought of his daughter as an heiress. He seems to have chosen a successor and Gulnara is the thorn on the road to be removed so the power transfer plan executes smoothly. Having lost her resources, among which the president’s patronage was the cornerstone, Gulnara has absolutely nothing to rely on. Gulnara will thus distance herself into shadows: she will speak in fewer international events; she will travel to fewer countries; and she will show less skin in less revealing defiles. As time goes, people will simply ignore her now wildly followed Twitter account. And when her father finally departs from this world, she will simply be forgotten. After all, without her father, either pleased or furious with her, she has nothing to show for herself and never had.